My Mother's Daughter: Come Celebrate NSD and Each Day with Gloria! Jan, I am sooooooo overwhelmed and touched by this blog train...tears just keep coming as I hop from blog to blog...your kit is sooooo perfect and pretty, THANK YOU for being my friend!! I love you tons!!! Love the border!! Love the frame, ribbon chevrons and of course the cupcake!! Beautiful papers!! Thank you so much for sharing!! 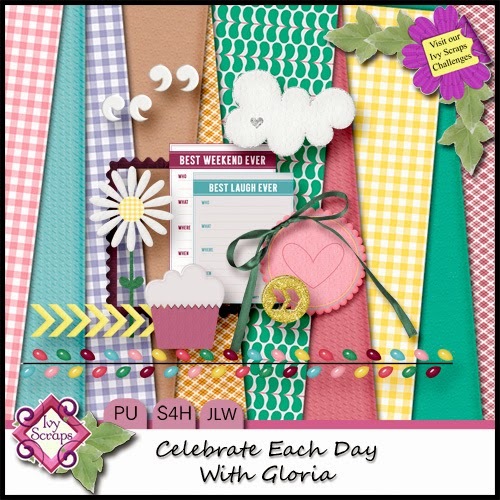 Love the colors and your gingham papers! Thank you for the great kit!